From the turmoils of the French Revolution, the Napoleonic Wars, plague and famine, a new society emerged in Europe at the beginning of the nineteenth century that espoused new values, new styles of living and new culinary habits. The celebrity chef was created to meet its demands for ever more extravagant feasts. Although this cuisine nouvelle, as it was called, was grounded in French culture, it owed its finesse to borrowings from the refined and prosperous cultures of the Orient. The Ottoman Empire was an unrivalled source of inspiration for the select, and highly competitive, band of chefs employed by European sovereigns. One such was Friedrich Unger, chief confectioner to the German-born King Otto of Greece, who travelled with his master to his new home in Athens and used the opportunity to visit Constantinople, heart of the Morgenland and a byword for luxury and exoticism. Unger’s book on Oriental confectionery, Conditorei des Orients, was written in 1837, after five years spent researching the subject. Although his tone can be high-handed, Unger is observant and precise. Describing pistachio sherbet, for instance, we learn that “the natural green colour” is “restored with spinach”. His Teutonic attention to minor detail and his wealth of recipes give a valuable insight into nineteenth-century Turkish confectionery. Equally painstaking has been the book’s rebirth. In 1982, Mary Isın, who has devoted years to researching the history of Turkish cuisine, heard a rumour about the existence of the book. Excited, she began to search for it. For eight years it remained no more than a rumour, until it finally surfaced in the Staatsbibliotek in Munich. Translating the text from German, researching all the entries and adding informative footnotes took another three years. Ingredients and methods had to be investigated, and all sorts of people consulted – professionals, housewives, friends, and elderly people with memories of vanished customs. Isın also had to try out many of the recipes herself. The quotations from travellers, writers and cookery books old and new, as well as her own personal observations, plus reproduction of miniatures and illustrations of utensils and ingredients, have all transformed this historical record into a brilliant reference work which might otherwise, as she puts it, have been “no more than a tantalising curiosity”. A King’s Confectioner in the Orient is in three parts: Unger’s own introduction to Oriental confectionery is followed by his collection of recipes listed under the original transcriptions of their Turkish names. The third section consists of Isın’s commentary on the recipes, in which she deals with misunderstandings and sheds light on missing information. Some confections, as Unger explains, were difficult to imitate since the ingredients “either cannot be found or [only] at great expense”. Isın fills in the gaps where Unger’s manuscript is silent. 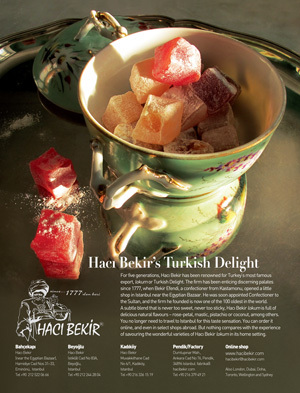 In her commentary accompanying his rather brief entry on lokum, she explains why what is known in England as Turkish delight is so different from the lokum found in Turkey: it simply isn’t the real thing, because the main ingredient of lokum is a starch obtained from wheat that was unknown to European cookery, in Unger’s day as now. This starch, called nısasta, which Unger fails to mention, has long been used in the Orient as a thickening agent for sweets and puddings. Because of its absence in the West – in England the very word starch is likely to conjure up images of ironing and linen – the jelly known as pelte, prepared from starch and fruit juice, has never become part of the repertoire of Western puddings. But, according to Isın, two Oriental borrowings did make their way to the West with Unger: the opaque sugar paste lohuk, under its new name of fondant, and a sweet known as peynir sekeri, or cheese candy, the origin of Edinburgh rock. Both made their appearance in Europe in the mid-nineteenth century. In Turkey a few of the concoctions and desserts listed in Unger’s book have vanished, while others have become less versatile. Of all the Sert Scherbet, or hard sherbet cakes, listed by Unger, only one variety has survived, the red lozenges known as lohusa serbeti, which can only be found in the most traditional sweet shops in Istanbul. These “cakes” are diluted with water and boiled briefly with additional sugar, cinnamon sticks and cloves to make a pleasant drink that is offered – hot or chilled, depending on the season – to guests visiting a new mother after the birth of a child. Unger lists twenty-nine flavours of this instant sherbet, from pistachio and orange-blossom to opium. None is available today. But it is reassuring to know that most of the fruit preserves, boiled sweets (akide sekeri), Turkish delight (lokum), helvas and sweet pastries (kadayıf and baklava, for instance) have happily survived, although many are nowadays manufactured using modern techniques. Perhaps for future editions of this book the publishers might be persuaded to include a facsimile of the original German text along with the excluded original colour plates. A King’s Confectioner in the Orient deserves this attention. It is a treasure-trove for cookery writers and professionals, but also of enormous interest to enthusiasts – with or without a sweet tooth. We can easily imagine that at about the same time that in England the Prince Regent was being served orange-blossom jelly by Carême, in Greece King Otto was relaxing with a tall, refreshing glass of Unger’s pistachio-flavoured sherbet.